Public Works Department (PWD) NEC Div. The Office of the Superintendent of Taxes Khliehriat is the Government Office which was entrusted to collect the revenue for the State of Meghalaya, by collecting taxes from all types of tax payers who fall under its jurisdiction and also to bring those non Taxpayer into tax net and to see that all taxpayers should pay their taxes in time. This Office was started during the year 2009 under Retired Shri J.B. Laloo as the first Superintendent of Taxes and with one Inspector and contractual basis staffs to help him. This office was open to reduce the work load from Jowai Superintendent of Taxes who also looks after Khliehriat Subdivision that time, at the same time to ease the taxpayer from going to Jowai to pay their taxes and to bring those non-taxpayer under the ambit of the Meghalaya Value Added Tax Act commonly known as MVAT, to achieve the aim of the Government to collect more revenue. 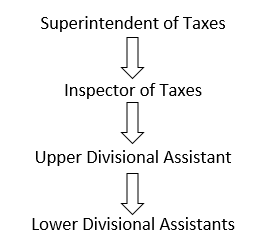 In the year 2011, the government has sanctioned two more post of Inspector of Taxes to help the then Inspector and also to assist the Superintendent of Taxes for the smooth flow of the different works and in 2015 permanent staffs were also appointed through DSC exam conducted by the district.